The number of individuals in a population, or population size, is perhaps the most important thing to know about a population. 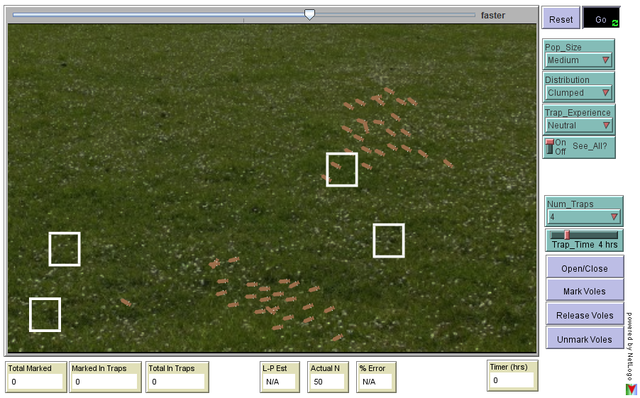 This model is an in-depth exploration of the mark-recapture method of estimating population size, simulating a population of meadow voles which can be trapped, marked, released, and re-trapped. This advanced model assumes familiarity with the Lincoln-Peterson estimate of population size. It is designed to be used in exploring how factors such as: population distribution, trap experience (learning to avoid or seek out traps), population size, and sampling effort affect the precision and accuracy of the estimate.